There is a long, wide row of orange day lilies growing against the sage green picket fence that borders one side of our front lawn. Red bee balm grows there too, and dark pink phlox, some yellow lilies, and a number of hollyhocks in a variety of pinks, reds, yellows, and white. Over the years these plants have spread, reseeded themselves, and formed a thick mass of foliage in front of the fence and something is always in bloom, so it is a surprisingly beautiful garden that has somehow happened without much help from us. Years ago when we were first trying to improve our rocky soil, in front of this fence was one of our few plantable areas, and it became a first home for many of the plant types I now have growing throughout my various gardens. The orange day lilies are an exception… I planted the few roots that were given to me there many, many years ago, and I have never planted orange day lilies in any other spot. So I have to wonder about the orange day lilies growing in five other areas of our yard. If these other lilies were anywhere near the fence, it would be understandable that the roots had somehow spread under the soil, but the new groups of lilies are all several hundred feet away from the original planting… including one really spectacular group of lilies with much darker orange blooms that is now growing beside our brook. 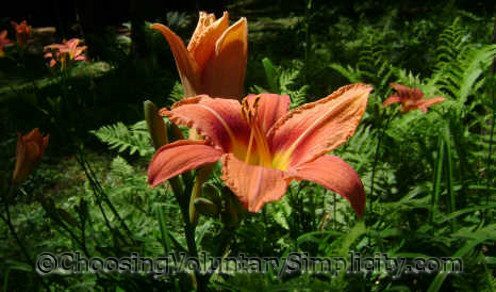 Orange day lilies are notorious for the way they can spread, and even a tiny bit of root left in the soil can produce new plants. But how did these new clumps of day lilies end up growing in new soil in areas where day lilies have never grown before? What Flowers Are Blooming In My Garden? 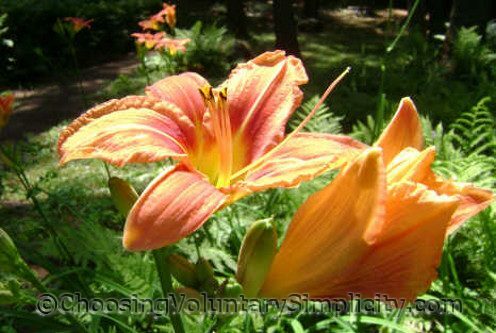 I love the old-fashioned orange day lilies. They are such forgiving souls and will grow about anywhere. When I was a kid, (about a hundred years ago) we had a whole side yard full of them! But the blooms didn’t last all that long. Too bad because they are beautiful. 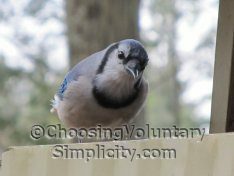 Your original garden by the fence must be heaven! Hollyhocks! My favorite, but I have never had good luck growing them. I guess the trick is to find the right spot and just let them be. Thanks for your wonderful pictures, Shirley. I come here every day for my “soul” food. Thanks for the article and the photos, they brought back a lot of memories. My mother used to have day lilies in her flower garden and I always thought they were so pretty. I like your blog, you’re always writing about something interesting and the photos are so inspiring. Those photos are gorgeous. I hope someday my my daylily will look like your’s. I do have some hollyhocks too and some beebalm. I am going to try to duplicate your garden in front of your picket fence. That sounds like a mystery you’re never going to solve. I think it’s incredible how tough and resilient plants are if they are just given the chance to do their thing. Your day lilies are beautiful, just the kind of thing I’d like to add to my garden next year after our move to the country. Right now the only ‘garden’ I have are three large containers, I can’t wait! Beautiful day lilies but I like those ferns too. I keep trying to grow ferns here but don’t have much luck with them. I think maybe we’re too dry and hot. Love your blog BTW.